Steve Fogarty was eager to get the game over and the party started. 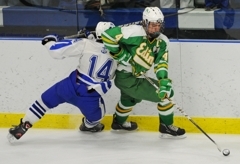 Edina had just clinched a 4-2 victory over Minnetonka on Thursday, Feb. 10, as Fogarty’s empty-net goal with 34 seconds left ended any hope of a Skippers comeback. For the Hornets, it was time to whoop it up. 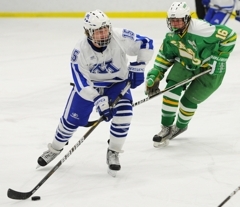 After all, they were just seconds away from ending Minnetonka’s 28-game unbeaten streak on the Skippers’ home ice at the Pagel Activities Center in Minnetonka. 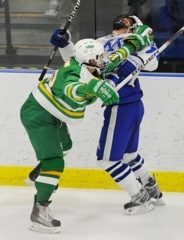 Then Fogarty saw fellow Edina co-captain Max Everson doubled over in pain, clutching his arm. There would be no celebration. Not on this night. “I went right over to him,” Fogarty said about Everson. “As soon as I saw his arm my heart dropped. I didn’t even know what to say. 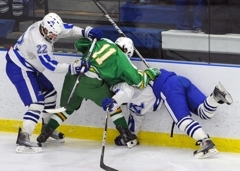 Everson, widely considered the state’s best defenseman, was injured while colliding with a Minnetonka player along the boards after making a pass that allowed Fogarty to score the empty netter. 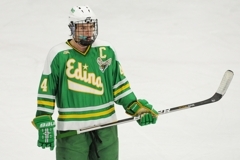 Everson was whisked out of the Edina locker room area and into a car outside the arena after the game. He was headed to a hospital to have his arm treated. 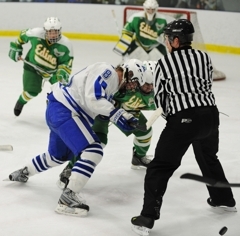 The injury marred what was an otherwise spectacular night for Everson, who was a big reason why Minnetonka’s high-pressure offense never mounted much sustained pressure. 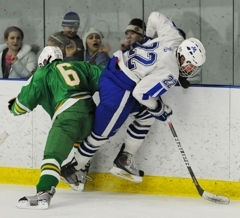 It’s hard to score goals when you slam into the Everson Wall time after time at the blue line. 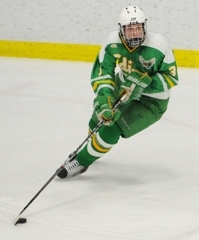 Everson’s gorgeous cross-ice pass in the neutral zone also set up a second-period breakaway goal by Jake Sampson. 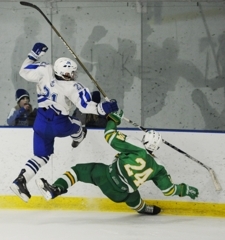 Is there a better defenseman in the state? Giles, a former NHL defenseman with the Minnesota North Stars, tried to stay positive after watching Everson leave for the hospital. He closed the door to the Hornets’ locker room for a meeting with his players and coaches, then talked about what the likely loss of Everson will mean to the defending state Class 2A champions. 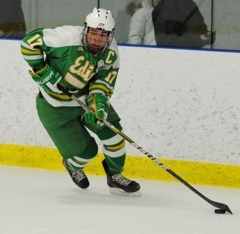 A 6-foot-1, 190-pound senior headed to Harvard next season to join his brother, Marshall, on the hockey team, Everson’s two assists on Tuesday give him 21 points (four goals, 17 assists) this season. 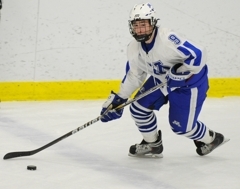 He turned down a scholarship offer from the University of Minnesota, among numerous other top Division I programs hoping to acquire his services. 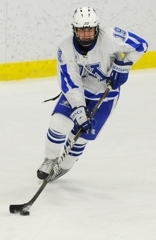 Best defenseman in the state? “I don’t think there is any question about it,” Giles said. 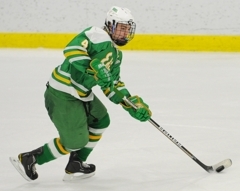 “I think the kid is the best defenseman in the state hands down. 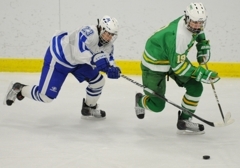 Edina, 13-6-2 and ranked No. 8 in Class 2A, looked like the Hornets that rolled through the playoffs last season with machine-like efficiency. They routinely beat the No. 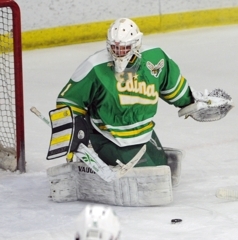 3-ranked Skippers (15-6-1) in races to the puck, and when Edina needed a big save, senior goaltender Connor Girard was there to make it. The only sour note in the performance was Everson’s injury. “They packed it in down low, and they won a lot of the battles that mattered,” Minnetonka coach Brian Urick said. “(Everson) was really good tonight. He’s really tough back there. Hopefully he is not lost for their sake. 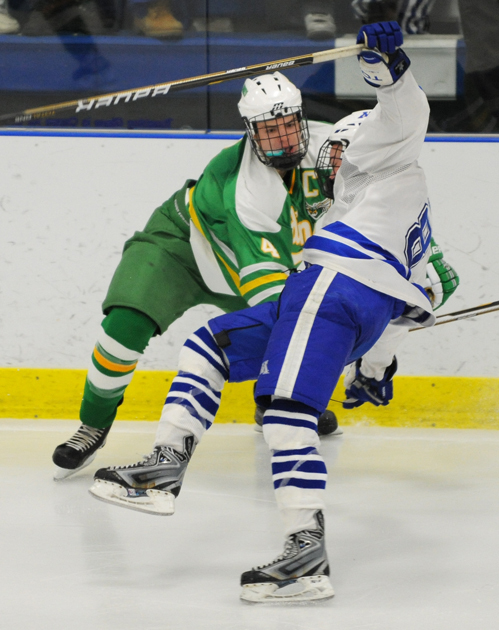 Senior Steven Fogarty scored 33 seconds into the third period and added an empty-net goal in the final minute on Thursday, Feb. 10, at the Pagel Activities Center as No. 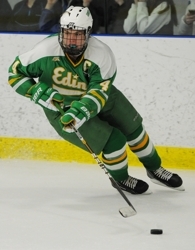 8-ranked (Class 2A) Edina snapped No. 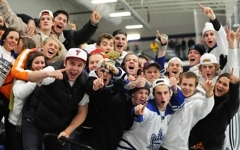 3 Minnetonka’s 28-game home unbeaten streak with a 4-2 Lake Conference victory. The game ended with star Hornets defenseman Max Everson, like Fogarty one of 10 finalists for the Mr. Hockey award, leaving the ice in the closing seconds with what appeared to be a serious arm injury. 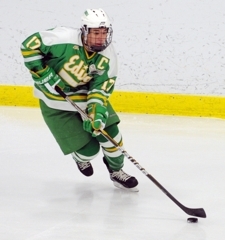 Everson, who turned down a scholarship offer from the University of Minnesota and has committed to play at Harvard next season, is widely considered to be one of the state’s elite defensemen. He was checked into the boards as he set up Fogarty’s game-ending goal. Everson was still in his hockey gear when, just minutes after the game, he exited the arena for a trip to the hospital. The score was tied at 1 after the opening period and at 2 after the second period. 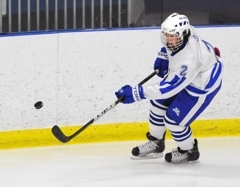 Sophomore Lou Nanne opened the scoring for the Hornets 5:37 into the opening period, but junior Erik Baskin answered with a goal just 39 seconds later for Minnetonka (15-6-1). 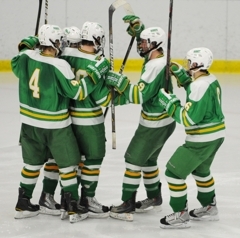 The teams hit rinse and repeat in the second, with Edina’s Jake Sampson scoring at the 3:44 mark, and Baskin responding with a goal 1:20 later. 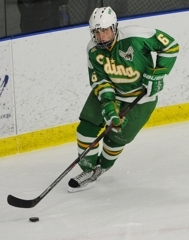 Fogarty scored on a rocket of a shot from the high slot to start the third, and the Hornets (13-6-2) controlled play for much of the rest of the period. 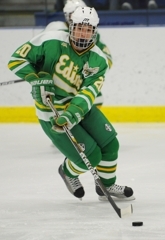 Everson had a standout performance for Edina before the inury, repeatedly shutting down Skippers’ rushes at the blue line and breaking Minnetonka’s usually fierce forecheck with well-placed outlet passes. He also made a great cross-ice pass that sprung Sampson on a breakaway for his goal. 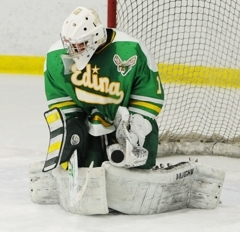 Edina fired 23 shots at Minnetonka goaltender Alex Glockner. 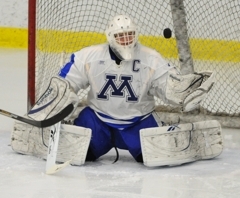 Hornets goaltender Connor Girard stopped 20 of 22 shots. 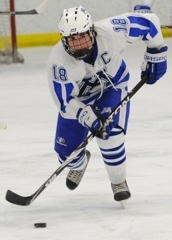 The hard-hitting senior repeatedly shut down Minnetonka’s high-flying forwards with his physical play at the blue line and in the corners, especially in the third period when the Skippers were limited to a handful of scoring chances. 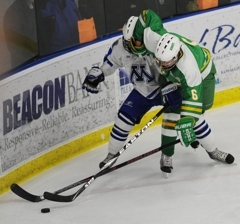 Everson, a Mr. Hockey finalist who exited the rink in the final minute with a serious arm injury, also set up the play of the night by springing Jake Sampson loose for a breakaway goal with a perfectly placed cross-ice pass. 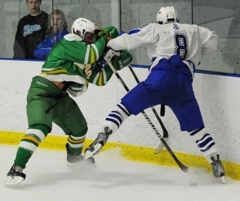 The senior forward and Mr. Hockey candidate scored twice in the third period to power the Hornets past the Skippers. He scored the winner in the opening minute of the third on a shot from the high slot, and capped the victory with an empty-net goal. The big junior continued his late-season eruption by scoring both Skippers goals, giving him a team-best 17 this season. Baskin extended his goal-scoring streak to eight games.